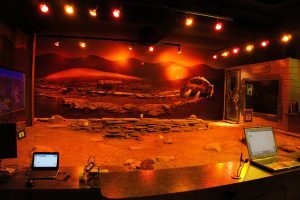 The Space Foundation’s Discovery Center is Colorado Springs’ first and only space, science and technology attraction. It was founded in March 1983 with the mission statement, “To advance space-related endeavors to inspire, enable and propel humanity.” The Center is also one of the world’s premiere nonprofit organizations supporting space activities, space professionals and space education. 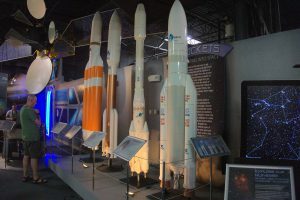 There are three facilities that are open to the public: The El Pomar Space Gallery, Northrop Grumman Science Center, and the Lockheed Martin Space Education Center. 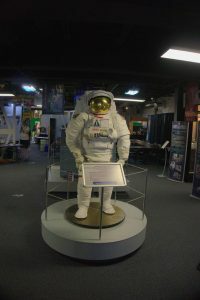 These areas are loaded with historical space gear and hands-on activities that are perfect for kids and adults alike. Perhaps the most interesting of which is the area where you can test pilot small Lego rovers through a Mars-like landscape using a computer in almost the exact same way the real Mars Rover is piloted. Other fun facts we learned on our tour were: on the real Mars rover movement commands take around 20 minutes to send up and execute, astronauts’ visors are coated with gold foil to reflect the heat waves given off by the Sun, and the original lunar landing module cost 2.24 billion dollars to make which equates to roughly 17 billion dollars in today’s money. Overall the Space Discovery Center was an informative trip through the history of humanity and space travel. With loads of hands-on activities for kids of all ages, including adult-aged kids, this tour was pleasant and very much enjoyable. This entry was posted in Attractions, Blog, Community and tagged colorado, colorado springs, Space Foundation Discovery Center, Tourist Attractions. Bookmark the permalink.